Iain King takes a hard look at how the First World War turned Hitler into a Fascist. 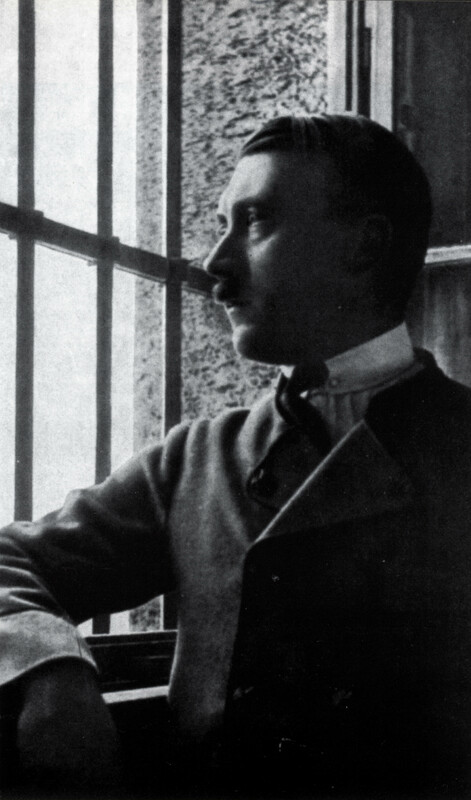 A posed propaganda postcard depicting Hitler in Landsberg Prison 1924. The impression is of the great visionary thinker imprisoned for his ideas. The ‘Great War’ had a profound effect on all the countries which took part. Most European empires were so shaken by the conflict that they changed their whole system of government. Perhaps the country which had most reason to be shocked by the outcome was the continent’s most formidable land power: Imperial Germany. German armies had hoped for a swift triumph over France, just as in 1870, when they managed to crush their rivals with just six weeks of fighting and a five-month siege of Paris. But in late summer and autumn of 1914, the rapid German advance was stalled at the Battle of the Marne. The Kaiser’s plan for a quick ‘knock-out blow’ failed and was replaced by a grim war of attrition. It was the years 1915-1917 which provided the Western Front’s haunting images of trench warfare. In lines stretching from neutral Switzerland to the Channel coast, millions of troops opposed each other across no-man’s-land, which was in places only tens of metres wide. Even though little ground was gained, and then only at great cost, tactics did evolve during these three years. The Germans suffered fewer losses than the Allies, partly because they tended to have better positions, partly because they defended more than they attacked. But the German Imperial Army did sometimes launch deadly offensives, such as Verdun in 1916, where they lost almost as many men as the French. And even defending ground was costly: their determination to hold the Somme against a British assault cost them some half-a-million casualties. German strategy changed in 1918 and the Germans went onto the offensive. Newly formed units of stormtroopers overran the Allied trenches. Movement returned to the Western Front, and in spring 1918 it looked as through the Germans might win. But, just as in 1914, the Kaiser’s generals pushed their men too far. Overstretched and outnumbered – especially as American troops started to arrive – the Germans were halted. The Western Front stabilised, then swung back east, as the Allies returned to the attack against a now-exhausted opponent. After fast-moving Allied victories in the summer and autumn, Kaiser Wilhelm II was forced to abdicate on 9 November 1918, and the whole German nation to accept an armistice two days later. Rabble-rouser, dictator, conqueror, architect of genocide… Hitler was many things, but can he really be described as a ‘thinker’? There is no evidence of great thought in any of Hitler’s writings, including Mein Kampf, his newspaper articles for the Nazi press, or even his ‘Second Book’, dictated by him in 1928 and finally published in 1961. Nor did he display any great artistic talents when he applied to study at the Vienna Academy of Fine Arts, and was rejected twice. Even Hitler’s rhetoric, which was tremendously motivating to his audiences, had a traditional structure. So can Hitler really be described as a ‘thinker’? He can because he had a unique role in forging diverse ideas into a single ideology – even though many of his ideas were appalling, and they actually originated with other people. Nazi dogma emerged from several other belief systems, including nationalism and anti-militarism, but its roots lie in a misinterpretation of evolution. In 1859 Charles Darwin had shown how species adapt to their environment: plants and animals best suited to their habitat are most likely to reproduce, while the others die off. Nazis twisted this idea of ‘survival of the fittest’. For them, evolution did not drive towards adaptation, but perfection. With their own view about what perfection meant – able-bodied heterosexual ‘Aryan’ men – they believed they should ‘advance’ society by improving its gene pool. Genocide had been used before – as a mass punishment or a precaution against an ethnic group rising up in the future. What made the Nazi Holocaust unique was that it sought to engineer a ‘better’ human race; mass slaughter with a ‘scientific’ basis. Millions were exterminated not for what they had done or might do, but simply because of who they were. Hitler’s ideology is now so totally discredited that related doctrines, like political racism, are now condemned by association. Hitler did not advance civilisation as a great thinker. But civilisation advanced despite him – through the understanding of ‘Social Darwinism’, racism, and genocide which we have gained from his ideas and career. Hitler at war (on the right). He spent most of his time at a relatively cushy post as regimental dispatch-runner. His mediocrity must have been apparent to his superiors: he was never promoted beyond lance-corporal despite massive casualties in four years of attritional warfare. In his autobiographical manifesto Mein Kampf, Hitler described his time as a soldier on the Western Front from 1914-1918 as ‘the greatest of all my experiences … the most memorable period of my life’. He likened the 16th Bavarian Reserve Infantry Regiment in which he served to a ‘university’ in which he learned about war; it transformed him from a ‘young volunteer into an old soldier’. Most important of all, Hitler claimed it was his experiences as a soldier which inspired his future career in politics. Some of the soldiers who worked alongside him praised Hitler for his courage. The regimental staff sergeant described him as ‘courageous and stood up well under strain … he showed a passion for war’. Another colleague said he was ‘brave, fearless, and outstanding’. Nazi propaganda made much of claims like these. In the 1935 book The Story of Adolf Hitler Told for Children, Hitler is described running ‘straight through machine-gun fire’ to deliver messages between outposts on the frontline and as ‘one of the bravest soldiers in every battle’. Hitler’s service for Germany became an essential part of his political message: he had served his nation in the most selfless way possible; now he demanded the nation should serve him in return. But just how patriotic was he, and could the young Adolf be considered a war hero? Before the war, Hitler dodged the draft. Conscripted to serve his native Austria in 1910, he failed to report for duty. He did this at least three times, and it was probably to avoid military service that he moved from Vienna to southern Germany. 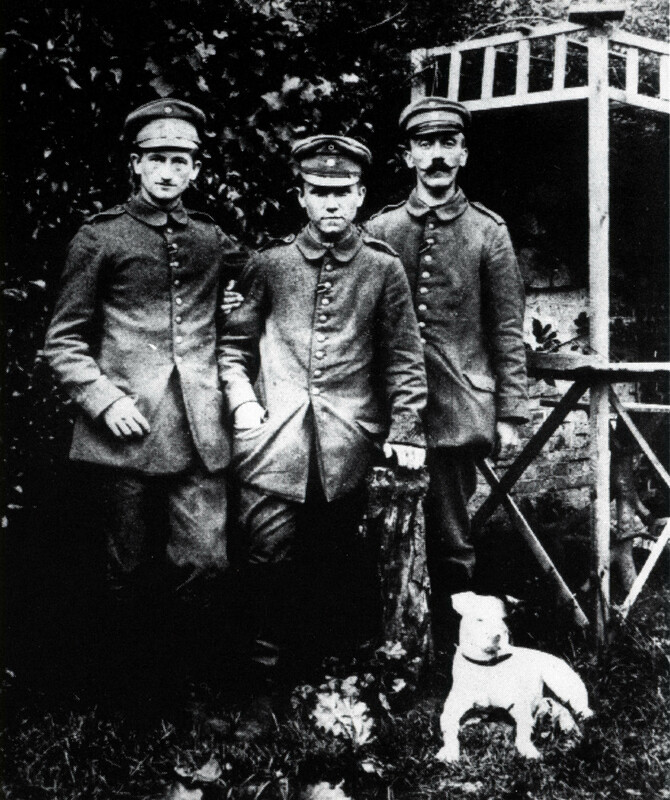 When the First World War started six months later, Hitler volunteered to serve in the German Army. After several weeks training, Hitler and his regiment were sent to the front, and experienced their first battle on 29 October, outside Ypres, in one of the most critical engagements of the war. Two weeks later, Hitler helped save the life of his regiment’s new commander, Lieutenant-Colonel Engelhardt, and was awarded the Iron Cross (Second Class). But from then on, Hitler was based at the regimental HQ, several miles behind the frontline. There he lived in relative safety and comfort, only occasionally venturing near the trenches; usually he was just delivering messages to and from the regiment’s administrative base, even further away from danger. Later in the war, Hitler even seems to have turned down opportunities for promotion to keep this precious role as a regimental dispatch-runner. Hitler was called into the frontline only when German manpower was stretched. This meant that he served at the Battle of the Somme, but only for four days. He suffered a ‘light wound’ in October 1916, and was gassed in October 1918, which meant he was in hospital on the days his regiment faced its worst battles. He missed other crucial days because he was on leave. Hitler’s ideology was shaped by war, but not in the way he claimed. Although he blamed the Jews for Germany’s defeat, he spent much of the war ingratiating himself with the regimental adjutant Hugo Guttman – who was Jewish. It was a citation from Gutmann which led to Hitler being awarded the Iron Cross (First Class); he won the honour just after the Kaiser had demanded that more privates be nominated. Based in regimental HQ, Hitler heard the officers’ view of bad morale on the frontline – that it was shameful cowardice. Much less than other soldiers did he witness the appalling conditions that drove many in the frontline to despair. This might help explain why, as Führer, Hitler demanded absolute loyalty and steadfastness, and remained particularly unsympathetic when his military began to buckle. Most of the ‘eyewitness’ testimonies to his bravery under fire do not bear close scrutiny: many were embellished by the Nazis, or by storytellers hoping to place themselves close to a celebrity. The dictator and his acolytes made sure less glowing accounts of Hitler’s war service were not heard. In the months immediately after the war, Hitler was trained by the army in propaganda. That – not his war service – taught him the lessons he used most in his rise to power. His description of the war in Mein Kampf was largely fiction; and it turned out to be far more dangerous than anything he faced as a soldier.